Open House This Sunday at The Fairways – Only 5 homes left! Kokes Family Builders offers an additional $15,000 off all remaining new homes at its award-winning Ocean County community (total incentives up to $62,230). Kokes Family Builders has unveiled its lowest pricing of the season with its special Fall incentive of $15,000 off already reduced priced new homes at The Fairways at Lake Ridge in Ocean County. As we approach the sellout of our community, we attribute our success thus far to ideal pricing, great location near the Toms River border and quality crafted homes with designer-inspired features and upgrades like granite countertops and stainless steel appliance packages. It’s down to the final countdown for The Fairways at Lake Ridge, one of Ocean County’s most sought after, 55+ gated new home communities. With only five homes remaining, Kokes Family Builders is offering a special Fall incentive of $15,000 off these already reduced priced homes for a limited time. Priced from just $284,000, prospective homebuyers are encouraged to visit The Fairways Open House on Sunday, November 5 from 1pm to 4pm to take advantage of the lowest pricing of the season. At The Fairways at Lake Ridge, homebuyers will experience quick turnarounds and closeout pricing on already reduced priced homes that are ready for immediate move-in (close within 30 days). With only five homes left, those interested should act quickly to take advantage of incentives of up to $62,230 before this special Fall incentive. Tucked away in beautiful Ocean County, The Fairways offers easy access to life’s everyday needs and desires. Situated in close proximity to Routes 9, 70 and the Garden State Parkway, as well as dozens of historic, cultural and scenic attractions across the tristate region, no destination is out of reach at The Fairways. Homeowners can enjoy the benefits of nearby outdoor recreation at Lake Shenandoah County Park, Cattus Island County Park, and the scenic beaches, boardwalks and amusements from Sandy Hook to Cape May. Lifestyle conveniences can be found along Route 9 and at Ocean County Mall, Jersey Shore Premium Outlets and Freehold Raceway Mall. All five homes are part of the Fairways Masters Collection and are available for an immediate move-in. “As we approach the sellout of our community, we attribute our success thus far to ideal pricing, great location near the Toms River border and quality crafted homes with designer-inspired features and upgrades like granite countertops and stainless steel appliance packages,” said Kokes. Prospective homebuyers can choose from the following home designs: The Pinehurst (one home remains from $310,000), Montauk (three homes remain from $295,000) or Saratoga (one home remains at $340,000). Homes offer 1,578 to 1,846 sq. ft. of living space with two bedrooms and two baths on a single-level. Other highlights include: Open floor plans with an open kitchen and dining space; a kitchen pantry with either an island or breakfast bar; a private master suite with a walk-in closet; a luxurious master bath with walk-in shower and walk-in closets; a flex room that can be used as an office, hobby room or third bedroom; a two-car garage with direct access to a mudroom, and a walk-up attic over the garage for out-of-the-way storage. Onsite amenities feature a state-of-the-art, 20,000+ sq. ft. clubhouse in a resort-style setting with indoor and outdoor swimming pools and a club-quality fitness center. Residents also have access to shuffleboard, bocce and tennis courts, billiards, cards and crafts rooms, a library, grand ballroom, meeting/event space, and nearly two miles of walking, jogging and biking trails. As an added benefit, residents can also take part in organized day trips, group vacations, over four dozen clubs, organizations and civic and hobby groups. Featuring a low maintenance lifestyle, The Fairways has contracted crews that take care of all community landscaping and snow clearing. All homes also come with a 2-10 HBW® 10-year homeowners warranty on major structural components that transfers with the resale of your home (with limitations). “At The Fairways, you can rest easy knowing you will have more time to do what you love all year-round,” said Kokes. The Fairways at Lake Ridge is offering brokers three percent commission and a $3,000 bonus per home sold for the remaining five homes. Kokes Family Builders is a third-generation developer and builder of active adult communities in Central New Jersey. The Fairways at Lake Ridge is located at 1 Fairways Boulevard in Lakewood. 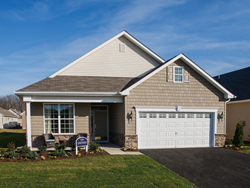 To schedule an appointment to learn more about the Masters Collection community at The Fairways, call Kathy Pascocello at Weichert Realty at 732-330-9339 or visit http://www.KokesFamilyBuilders.com.